The snowy rideline of Bridger Bowl beckons, cracking sharp against cut-cold cerulean. However, wintery spectacles are lost on a group of skiers lined up for the 8 a.m. start of Bridger’s annual Skin to Win Randonee Rally. Unbelievably, these competitors have paid real money today not to ride the lifts. Instead, they plan to trek up the mountain with the aid of skins on the bottoms of their skis, then strap their skis to backpacks and hike the final pitch to the summit. After much gasping, they will click back into bindings and head south atop the ridge over a bucking trail punctuated with impish “thank you ma’ams” and interrupted by a boot pack scramble along the way. But it’s not over yet. They’ll take off their skis one more time and climb partway up the Saddle to the south boundary. There, on an uneven, windy outpost manned by ski patrol, they will struggle to put their skis on again and slip-slide down an expanse of packed snow the consistency of a sheet of Styrofoam. After rumbling through the chunked-up slopes of Schlasman’s, they will reach their destination: a short, slightly irritating incline to the finish. This may sound like an insanely aggressive way to get some exercise, but for many who pursue the sport of rando (randonee) or skimo (ski mountaineering) racing, it’s a glorious mix of camaraderie, intermittent hypoxia and physical punishment. 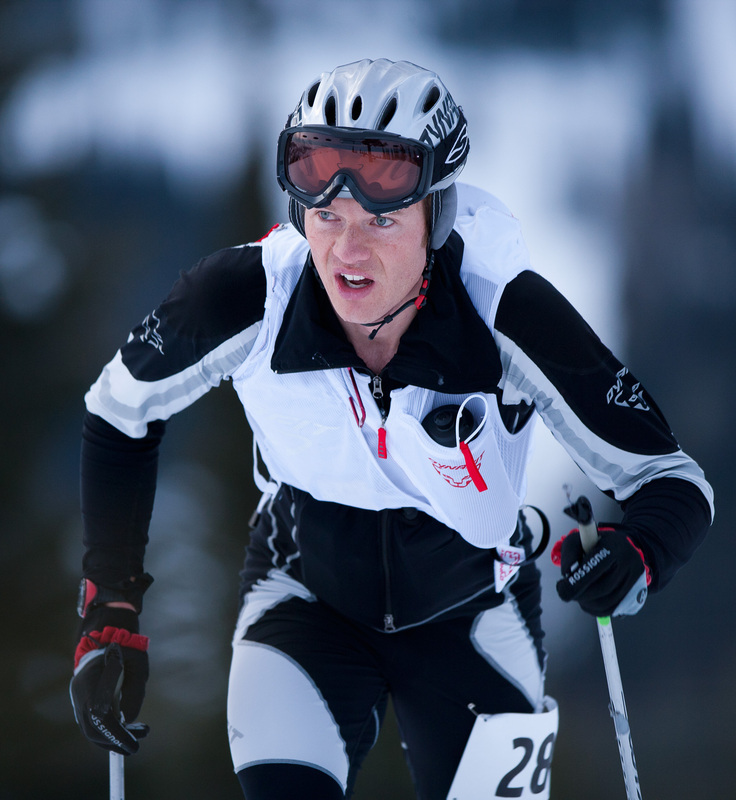 A typical skimo race offers pro and recreation divisions. Thus, the less-experienced rec skiers — many on heavier backcountry or telemark outfits — begin the trek halfway up Bridger Bowl. Meanwhile, the pros, clad in skin-tight Lycra suits and lightweight boots, line up in front of the Jim Bridger Lodge at the base and systematically attack the mountain on featherweight skis. While traditional backcountry skiers explore mountains searching for gorgeous views, the best powder, a perfect line and absolute solitude, ski mountaineering racers, like those gathered at Bridger Bowl, are all about getting up and down the mountain ASAP. Races cover a variety of terrain, much of it up, so that skiers swap unseemly gains in elevation (with the aid of detachable skins on the bottoms of their skis) with boot packing and white-knuckle downhill runs on tiny skis. When all the numbers are added up at the Randonee Rally, pros will rack up 5,000 feet in elevation gain over a longer course, while rec skiers will cover half that. Randonee is not new to alpine areas of the world; out of necessity Europeans have traveled snowy terrain on skis for centuries. What began as military training to patrol high mountain passes in the early 1900s morphed into full-scale competitions among military teams, with growing public participation from the 1930s onward. More recently, here in the West, adventurists seek out remote, off-piste locales for untouched caches of powder and the wildness that lies beyond the periphery of established ski resorts. But skimo racing is left wing of all that. Like our hysterical pursuit of all things extreme, backcountry hatched skimo, an ultra endurance test on snow that requires guts, off-the-charts aerobic capacity, and specially designed equipment. Basically, anyone with a set of lungs and some backcountry equipment can enter the world of rando training and racing. That includes world-class ultra runner and competitive cross country skier Nikki Kimball, from Bozeman, who took up skimo three years ago. Even experienced, high performance athletes like Kimball face a learning curve. In her first Skin to Win, she recalls, laughing, “I was the first woman up the hill, but then I started messing with my binding and everyone passed me. I made every mistake you could: I brought only one pair of skins, I was bad at transitions, and I blew out a skin and had to run the whole ridge section.” More recently, with everything under control, Kimball was the fifth American woman at the 2012 United States Ski Mountaineering Association (USSMA) Championships in Jackson Hole, Wyoming. While Europeans have been racing for decades, here in the U.S. the sport has proliferated in just the last 10 years, according to Pete Swenson, skimo guru and director of the United States Ski Mountaineering Association, which now lists more than 30 races nationwide on its website, including the Skin to Win and the Whitefish Whiteout, a hometown favorite of Parsons and the Frenches. 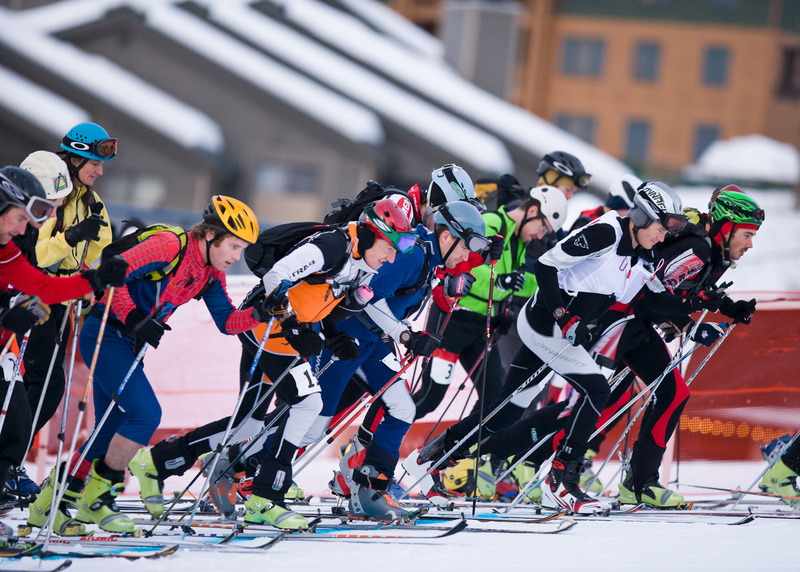 “Skimo racing has experienced amazing growth in the U.S., and the quality of competition has improved dramatically, especially with an increasing number of trail runners taking up the sport in the offseason,” says Swenson, who started the highly successful COSMIC race series in Colorado seven years ago. A goal of USSMA for the 2013-14 season, according to Swenson, is to establish a national race series with a point system for rankings. Known for their concentration of elite athletes, Colorado and Jackson Hole, Wyoming, are hotbeds for rando, but Montana clearly has its own stash of endurance athletes who number among the nation’s finest skimo racers. 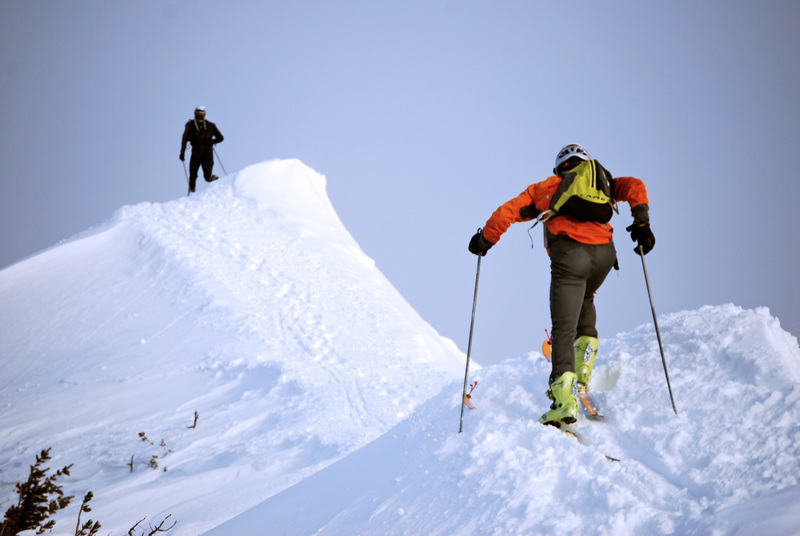 Colorado and Wyoming hold another edge as well, because many resorts there allow uphill traffic, providing convenient training access for skimo devotees. While Whitefish Mountain has two routes designated for training, Bridger Bowl has yet to make slopes accessible, which may be restricting growth of the sport in an area rich in high-performance athletes and recreational enthusiasts alike. “There are some amazing athletes in Bozeman,” Kimball says, “but we are at a huge disadvantage in training without access to groomed trails.” Setting trails and dealing with avalanche issues at the same time can be time-consuming and sometimes dangerous. For now, many Montana skiers will have to satisfy themselves with makeshift training routes in the backcountry and the occasional adrenalin-popping thrill of races like the Skin to Win and the Whiteout. What better way to bond with a fellow skier over a beer than to share a death-defying tale of performing the “rando slide” on skinny skis on a narrow strip of boney snow between the walls of Bridger’s Hidden Gully. For training or competition, skimo racing gear is an alpine-nordic hybrid with one guiding principle: go light. Skis are an average 160 centimeters in length with the best engineered weighing less than 2 pounds. Bindings are adjustable so the heel locks in for downhills and releases for uphill travel, while lightweight boots are easily tightened or loosened for ascents and descents. For racers, mohair skins rather than synthetic are essential for superior glide. Expect to spend about $2,000 on a full racing setup. 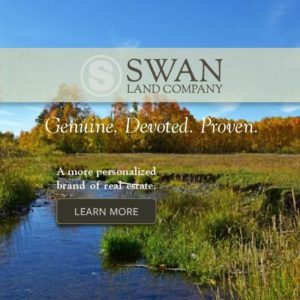 Most ski shops in Montana do not stock the gear, but will put in a special order for you. Don’t let pricey equipment hold you back, however. 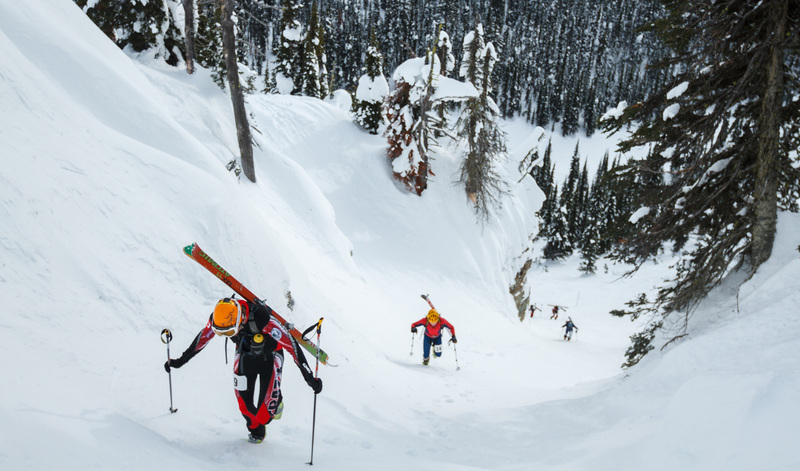 Heavier backcountry gear is perfectly acceptable in competitions. Transceivers are required in most races, along with helmets. Lightweight bike helmets are preferred. Competitors including, Ben Parsons and Brandon French, at the start of the annual Whitefish Whiteout race at Whitefish Mountain Resort, first climb is 640 vertical meters.